For the last year now Apple’s had pixels. Apple’s had more pixels for the price than anyone else by a long shot. The change now is they are getting pixels into more hands. They’re pushing pixels. I’ve written extensively about how useful a Retina display is. I do recommend looking at the difference it could make to your workflow. How is Apple now weighting their Mac Book line? Certainly the new Mac Pro stole the show, and rightfully so. But I think the real story is that it’s certainly Pixels now for everyone. Here’s a search on New Egg of all monitors at 1600×2560 pixels. 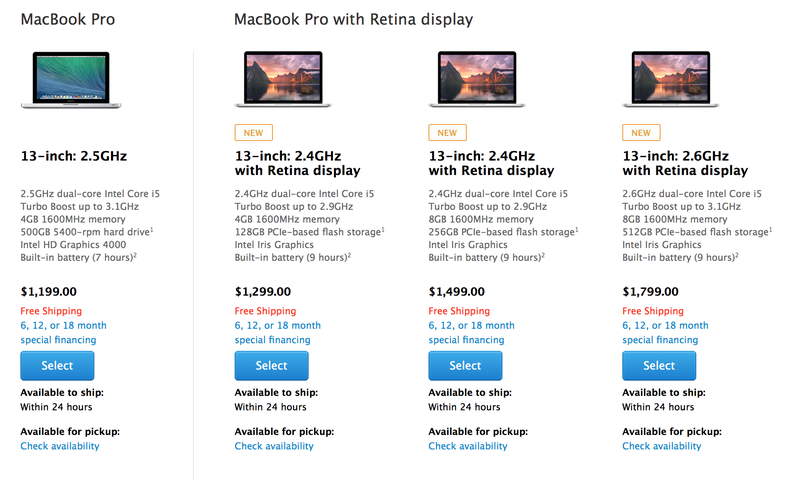 As you can see the cheapest display at that resolution is $800, and most are well $1,000. So for $500 more than the cheapest you’re getting this, a 13’ MPB Retina. That $800 monitor is a 30”. Attach that to a tower and wow, you are certainly not going to Starbucks with that thing. Photography is changing. Studios are still an extremely viable part of the business model, they are increasingly becoming the minority though. Photographers are cutting their bottom line and staying portable. This is your machine for that. Take your portfolio, you calendar, you library, your editing machine, your display device, and your ordering tech all with you in a shoulder bag. Need some extra computing power? Just plug-in another video card. Need some TB of storage? Plug it in. Need a 27” display? No mystery there. It’s crazy because all that can be on one cord. Apple’s Innovations are often seen in industry change. I see this change immediately in how I interact with my pictures. The industry hasn’t caught up yet. Mark, this is perfect timing. I’ve been waiting to upgrade from a MacBook Air and your blog entry helps in the selection process. Thank you!